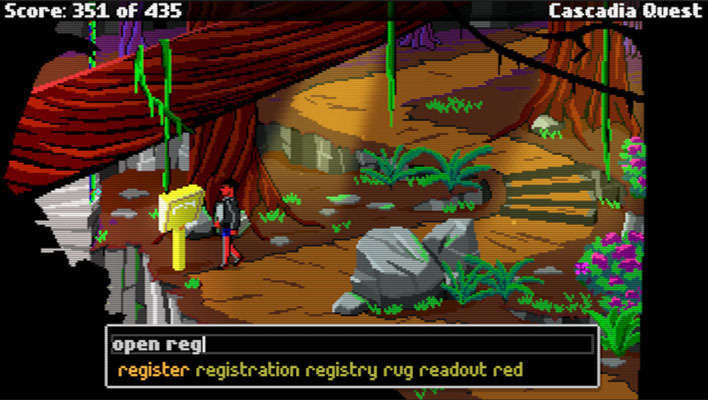 ﻿ Cascadia Quest - a classic adventure game. Control your character with Sierra-style typing interface - but streamlined with modern features like autocorrect and autosuggest. Something evil is afoot in the mountains of Cascadia, and you find yourself caught in the middle of it. Nostalgia without the pain - Puzzles, but no dead ends. Plenty of death lurking around every corner, but quick recovery with autosaves. Meet a host of quirky characters on your journey. Converse naturally with them using the parser! Cascadia Quest brings the classic text parser adventure game into the future! Understands which objects are in front of you and provides autosuggest and autocorrect. Lots of things: dense forests, glaciers, lava, tortillas, secret lairs, goats, and Pacific Northwest lore. No need to save every few minutes (though you can if you want). Restore quickly if you die! Enjoy that slightly fuzzy true classic look. No beeps and boops! Real music! Plenty of challenging but logical puzzles, and lots of deaths - but no dead ends! Since monitors are more rectangular than they used to be. Are you a veteran of early 80s adventure games? You can turn off all the modern conveniences so you can suffer most purely! Q: A text parser? Really? A: Yep! As an adventure game interface, the text parser mostly went the way of the dodo when mice and point-and-click interfaces came along. Some of the reasons are easy to understand - typing can be tedious, and finding the right word to use was often tricky. But typing does offer a freedom of expression that a fixed set of verbs doesn't. To address the issues mentioned above, Cascadia Quest uses a contextual auto-suggest algorithm as you type. The right words are never more than a few keystrokes away! And with careful design and playtesting, any "guess the word" problems can be avoided. Even better, the game understands your character's location in the game world and what objects are in front of them. So you can often just type 'get', 'look', 'eat', or whatever you want to do with the mysterious object in front of you! It really works quite smoothly and quickly. If you want to see a similar parser in action, check out our Snail Trek series. A: No, not really. 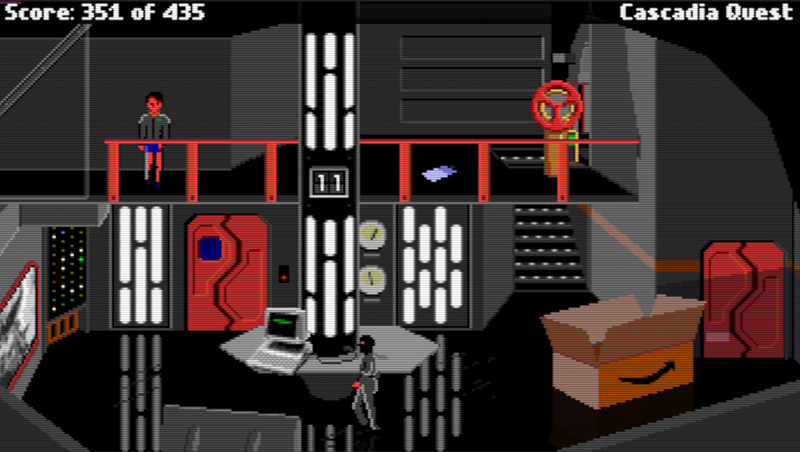 But Cascadia Quest uses a color palette derived from the dithered combinations of the original 16-color EGA graphics. This ends up being a distinctive fixed 136 color palette. In addition, subtle (or often not-to-subtle) lighting effects are used where appropriate - enough to create the right atmosphere but still evoke nostalgia. The game's resolution is 356x200. 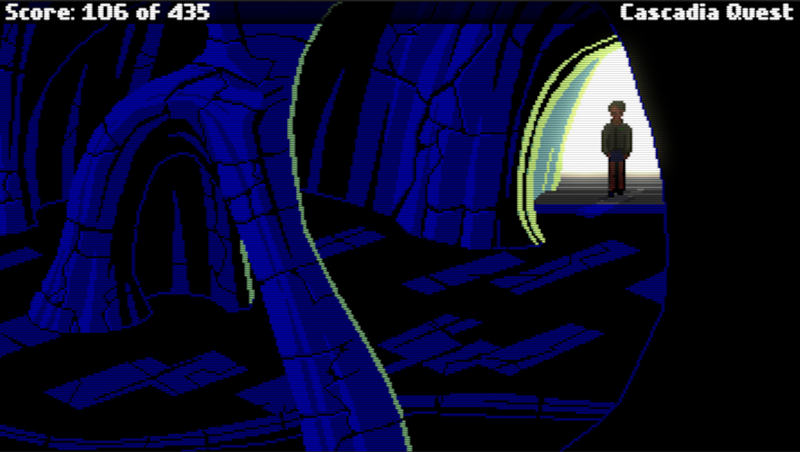 This is basically the widescreen version of the typical 320x200 resolution of early adventure games. You can of course play at any resolution, and the CRT filter will make it look good!